I’m very sad to say that Marvel’s Avengers cartoon, Earth’s Mightiest Heroes has not been renewed for a third season. Disney XD is still going to be showing all of the second season, so the show isn’t axed, but once they’ve finished with season two, the show is no more. I can’t remember the last time I’ve enjoyed a Marvel Cartoon as much as I’ve enjoyed this one. So what happened? Disney did. 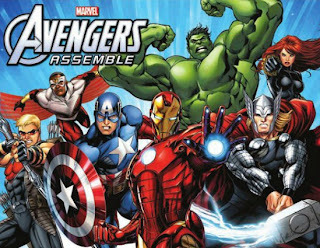 Earth’s Mightiest Heroes was in the works before the studio with its own animation teams bought Marvel. We will be getting Avengers Assemble, a new cartoon that looks just like that movie that you might have seen. I’m going to try and give it an unbiased shot when it debuts, but killing a show I like to start a new one makes me want to hate it. Also head of Marvel TV Jeph Loeb has been quoted as saying he doesn’t like multi-episode arcs because he wants kids to be able to sit down and instantly understand the episode. Can we give kids some credit please? As a kid the multi-part stories seemed epic. I’m going to enjoy Earth’s Mightiest Heroes while I can. I had talked about my love for the Hawkeye/Black Widow/Mockingbird episode. Recently they topped it by including my favorite Marvel character, Iron Fist. 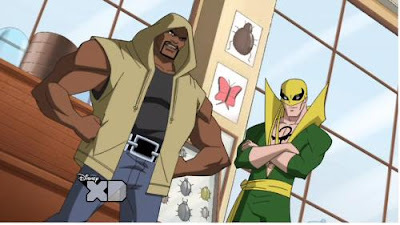 Actually they went the full Heroes for Hire route and we got Luke Cage and Iron Fist. On top of all that, they included the Scott Lang version of Ant Man. The first Avenger related comic I ever read was a story that teamed Hawkeye and Scott Lang against Taskmaster. It cemented Hawkeye as my favorite Avenger and Taskmaster as my favorite Marvel villain. Sorry to break your heart Mightiest Hero fans. Just know I’m right there with you.